When I entertain I often serve a few petit four-size desserts, so there is a variety of flavors to suit everyone's taste. Such was the case when Maddie and her team had a progressive dinner recently. My nephew, Ethan, had never heard of a progressive dinner, but was intrigued by the idea especially when he learned I was to do the dessert course. He loves all things sweet. 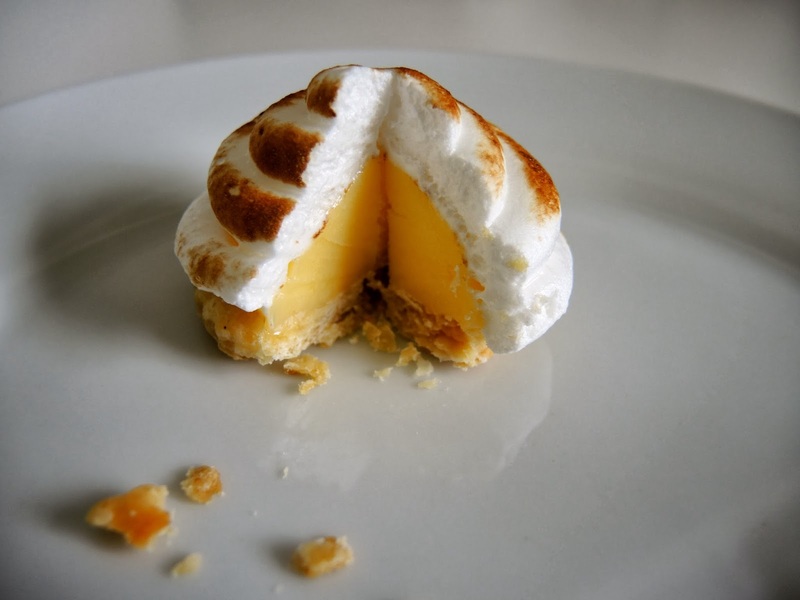 Maddie requested Lemon Beehives which are a petit twist on lemon meringue pie. 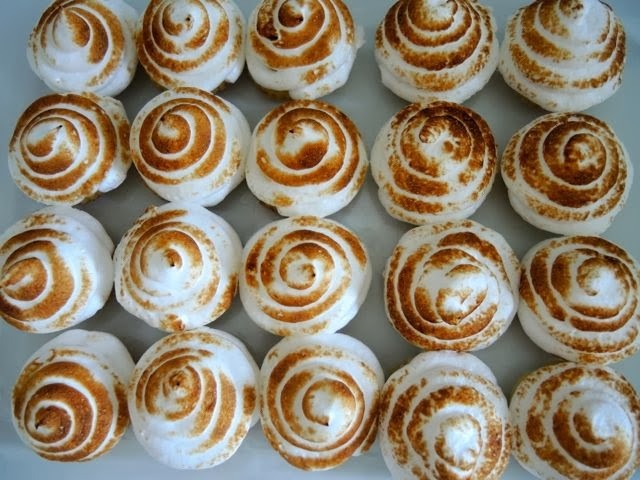 Their fun, small shape with swirled meringue resembles a beehive. Sweet, tart, lemon filling rests on a crisp pastry base. 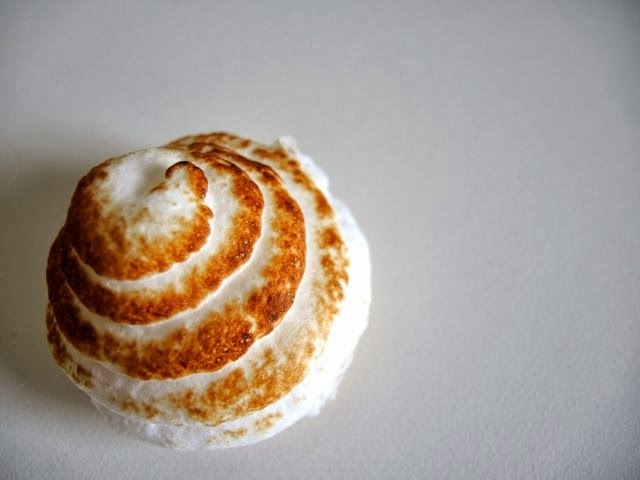 Then the whole package is enrobed in fluffy meringue which is toasted by a kitchen torch or a real blow torch, which I prefer. My dear, departed husband gave me a true blow torch, from a hardware store many years ago with a wonderful flame-spreader attachment that is perfect for even toasting. Nothing is more fun than power tools in the kitchen. While I asked for the torch I don't think his intensions were entirely selfless, as we both loved to brûlée food. Unfortunately, I don't think you can get find the spreader attachments any more, but I prefer the power of a real blow torch to that of the more domestic versions made just for cooking. The beehives look complicated, but they are surprisingly easy to make. The pastry bases, the lemon curd, and the finished beehives can be made up to 3 days ahead. Just allow the beehives to sit at room temperature 10-15 minutes before serving. The finished lemon curd should be thick, yet light, and fluffy. Freeze in a covered glass container until solid. Allow the lemon curd to soften slightly before making the lemon curd balls to make it easier to scoop. 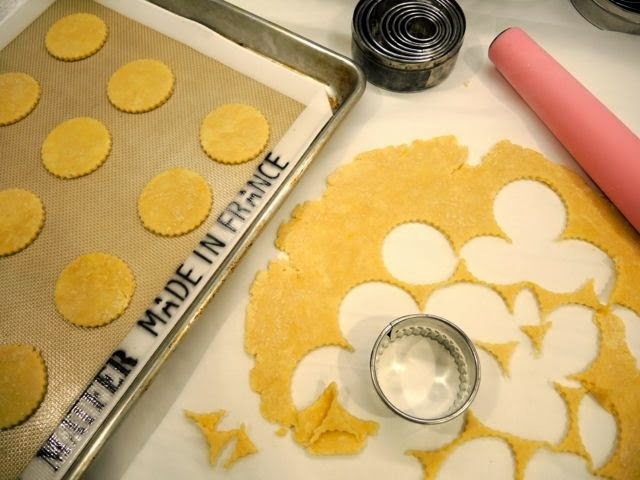 Although you don't necessarily see the base I like to use a crimped (2-inch/5 cm) cookie cutter because it makes a pretty edge, but a plain cookie cutter works fine. Or a small-rimmed glass will work, too. 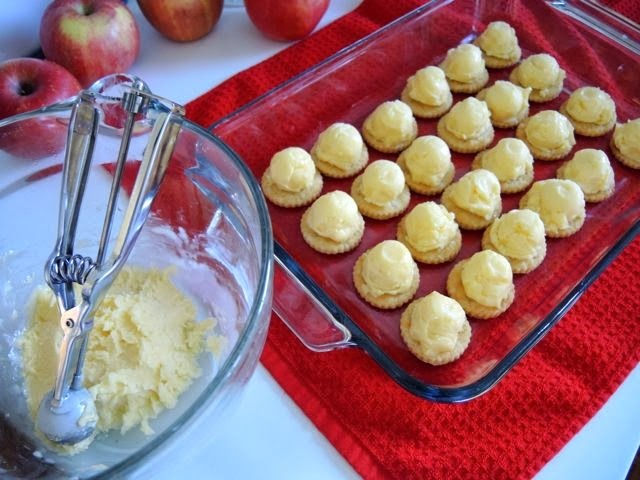 A small (1-inch/2.5 cm) ice-cream scoop is perfect for making the lemon curd balls to rest on the pastry bases. 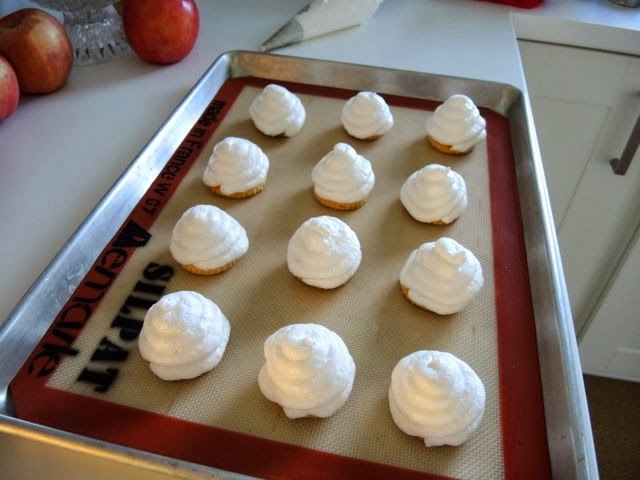 Divide the beehives onto two trays before piping and toasting the meringue to give yourself more room to work. Store the finished beehives in a container deep enough to tightly cover the beehives without touching the tops. To make the lemon curd - beat eggs and sugar in a mixer with a whisk attachment until light and fluffy. While the eggs are beating bring a few inches of water to a simmer in a saucepan. Once the eggs and sugar are thick and light add the lemon juice and zest. Put the bowl over the simmer water (don't let it touch the water) and stir with a whisk until the curd is very thick. Remove from the heat and whisk in the butter a piece at a time until all the butter is incorporated. Transfer to a glass container allow to cool. Cover tightly and freeze until solid or overnight. Can be made up to 3 days ahead. To make the pastry bases - put the butter, flour, and salt in a mixing bowl of a standing mixer with a paddle attachment. Mix until the ingredients look sandy. 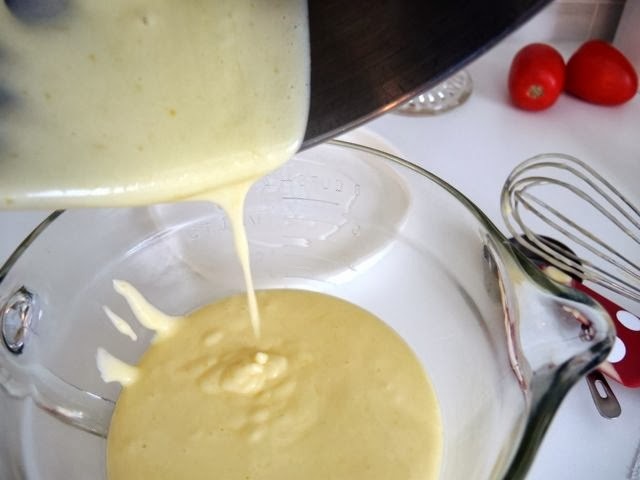 In a small bowl mix the egg yolk and sour cream or crème fraîche add to the flour mixture. Mix just until combined. Gather the dough into a disk, wrap in plastic wrap, and refrigerate at least an hour and up to 3 days. (5 cm) cookie cutter. Put bases on an ungreased baking sheet and prick with a fork. (Use a silicon baking mate or parchment paper if you wish.) Bake for 12-15 minutes until golden brown. Cool on a rack. If not using immediately store in an airtight container in the freezer until ready to assemble the beehives. To assemble the beehives - remove the lemon curd from the freezer and allow to sit for 10 minutes to soften slightly. Meanwhile arrange the bases in a container that is deep enough to cover the finished beehives without touching the tops and will fit in the freezer. Use more than one container if necessary. 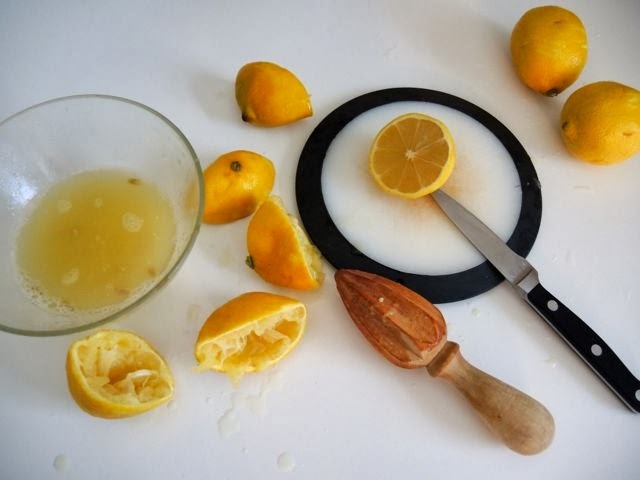 Using a small (1-inch/2/5 cm) ice-cream scoop place a ball of frozen lemon curd on each base. Return to the freezer until reading to pipe the meringue. To make the meringue - beat the egg whites and pinch of salt until foamy. Gradually add the sugar until meringue is glossy and stiff. Put meringue in a pastry bag fitted with a small round pastry tip. Starting at the base swirl the meringue in a circle around the lemon curd ball until you reach the top creating a beehive effect. 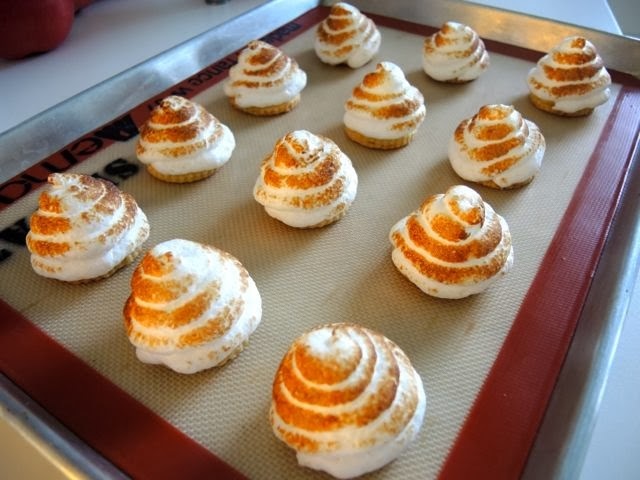 Using a kitchen torch, a blow torch, or a broiler toast the meringues until lightly browned all over. Store in the freezer until ready to serve. Allow to sit at room temperature about 10 minutes before serving. The finished beehives can be made up to three days ahead. Note: Depending upon size of the lemon curd balls and the piping tip you use you may have some lemon curd and/or meringue left over.